Each pouch holds up to 4 oz. and features a clear window to see food inside. Pouches are freezer safe and BPA, PVC, phthalate free. Food and freezer safe. Use with the Squeeze Station or Simple Squeeze Kit. Suit for Age:Over 6 Months. We will do our best to solve your problem. 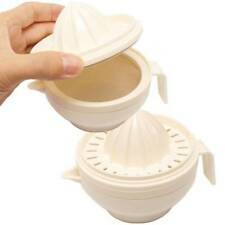 Baby Food Mill Bowl Set Manual Masher Grinder Handheld Travel Portable Fresh. Special texture bowl for easy grinding and chopping food. Easy and convenient juicer, balanced nutrition for your baby. 1 Baby Food Mill Bowl Set. Suit for Age:Over 6 Months. Cheese Cutting Case for baby and child/picnic/Snack/Safe cut/Excellent!/Good!! 3,Eaten away as sliced shape after stripped the cheese plastic cover. Cheese Cutting Case. The edge of it cuts the cheese into mouth size of infants. 1,Open the top cover and place the cheese while one did not remove the plastic in the molds. Material free Phthalate, BPA, Latex, PVC, Nitrosamine. Includes recipes to make your own child's food. Purees and minces for a fresh and easily digestible dish. Item model number 125-106. About the product. Steam basket capacity: 50-300g Blender. Excellent for vegetable puree,fruit juice,milk shake,filling for dumpling,etc. This product provides several cooking modes with you to make baby's food,steam/blends/cook/defrost,etc,you can DIY your baby's food with this machine. It has different types of grinding ways including juicing, filtering, crushing and holding food. Grinding Bowl. - The product is easy to clean. When you finish using it, just wash it with rushing water and let it dry out in the air. Suitable for microwave ovens, dishwashers, can not boil at high temperatures. This item is well made of premium material for durable and practical use. It lets you mash up fruits and vegetables easily and quickly. Spoon size: 12cm/4.72in, Grinding rod size: Length: 14cm/5.51in, Width: 2cm/0.79in. Grinding spoon: Length: 16cm/ 6.30in Width: 6.5cm/2.56in. 1 Set x Grinding Bowl Kit. Classification: Bowl. Material : Plastic PP，BPA Free. On the other side is a blender that purees food at three different speeds to attain the ideal consistency. Steaming baskets, removable trays, cooking water container, lids, spatula and blending jug are all dishwasher safe. Style:Food Processor. The only baby food processor with 6 different functions: steam, blend, sterilizes (up to 3 full size bottles), defrosts, reheats and warms bottles. It is fully programmable and alerts you when it's complete! Hold up to 4 ounces of semi-solid puree. Each pouch holds up to 4 oz. and features a clear window to see food inside. 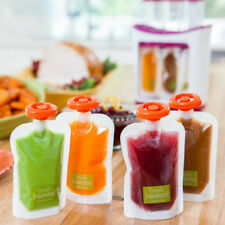 Pouches are freezer safe and BPA, PVC, phthalate free. Use with the Squeeze Station or Simple Squeeze Kit. DESIGN: The product has 4 different types of grinding filter for processing different food, also there is a grinding rod, a grinding spoon and a spoon in the set. Material: high quality food grade PP(BPA free). "Gino mom worry multi food cutter Orange" is, various food in the bowl, is baby food for masher that can be easily cut into bite-size. You can or that up to a size of about 1cm in a manner that use the scissors. 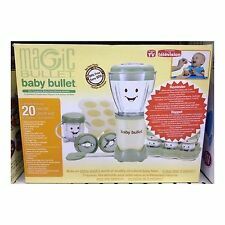 Product list: Baby food grinder set x 1. The product has 4 different types of grinding filters for processing different foods, as well as a grinding rod, an abrasive spoon and a spoon. All you have to do is steam them and grind them into a smooth paste.